Author: Drainie, Bronwyn Set In . . . Description: My Jerusalem begins with the preparation for and arrival in the Middle East. Bronwyn, her husband Patrick Martin and their two boys went there because Patrick was asked by the Globe and Mail to become its first Middle East correspondent. Living right on the Green Line between Arabs and Israelis, Bronwyn had to get her children settled in a new school and learn how to behave, react, drive, cook, and dress on the cusp of two unfamiliar and historically antagonistic cultures. She also had to struggle with Hebrew, and adjust to a major change in her professional identity as a writer. 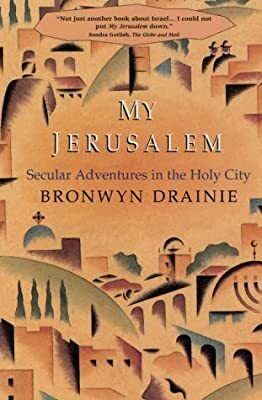 From this unique perspective, she was able to capture the charming and engaging side of Jerusalem life, along with the curious, the provocative, and the horrible. An independent woman coping with restrictive cultures on all sides, she was able to make meaningful contact with people in both communities while maintaining the journalistic distance needed to trustworthy observation. Out of her rich two years' experience, Drainie has woven a highly readable narrative that will appeal not only to those who avidly follow events in the region but also to readers whose eyes normally glaze over when they hear the words "the Middle East."